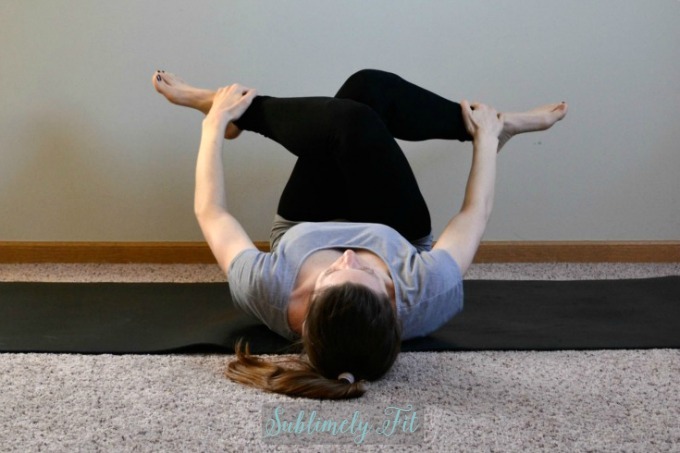 When I’m teaching yoga to runners, I almost always get asked about hip openers. Both my online clients and my face-to-face students always want to do more hip openers, probably because the muscles in our hips get so tight when we run. However, in my personal experience, many Type A runners push themselves to practice deeper poses than their bodies are ready for (hello, Half Pigeon), especially if they haven’t been practicing yoga for very long. That’s why in this post I want to share what I think are the best hip openers for runners, especially runners who have very tight hips. Finding the right version of the pose for your body is key, which I hope to help you with today. Disclaimer: I am a yoga teacher but I’m not your yoga teacher (probably). If you have questions about how to come into a pose, consult your teacher, who will be able to see any adjustments that need to be made in your body. Also, be sure to check with your doctor before starting any exercise routine. Your runner friends who have been practicing yoga for a while may be ranting and raving about Pigeon Pose as one of the best hip openers for runners. But, that doesn’t mean that your body is ready for the full pose, especially if your hips are very tight. If you try Half Pigeon and you feel like you’re struggling to find a position where you can comfortably melt into the pose, please work on building flexibility with Reclined Pigeon first. You want to find a pose where you feel a comfortable stretch—when you try to practice a pose that’s too much for your body, your muscles will tense up instead of relaxing. When you find the right pose for your body, your body will be able to relax and let the pose happen. You can start Reclined Pigeon with your back foot on your mat, crossing the ankle of the top leg just above the knee of the back leg, flexing the top foot. This pose is also sometimes called Figure Four pose because it almost looks like you’re making a figure four with your legs. To intensify, only when your body is ready, pull your back leg closer to your chest. A nice variation is to bring your back foot against a wall, moving your body away from the wall for a gentler stretch, scooting in toward the wall for a more intense stretch. I love Reclined Cow Face Pose because you can easily make the pose more or less intense when you’re lying on your back. To come into the pose, bend both knees and bring them close into your chest, stacking one knee over the other, the insides of your knees facing toward you. If this feels like a good stretch, stop and hold here for a few breaths. If you need to intensify to feel a nice stretch, grab onto your ankles, calves, or whatever is available to you, pulling your legs closer to your chest. Hold for a few breaths, then carefully release. You can repeat the pose a few times to find more opening through your deep seat muscles. I love Reclined Bound Angle Pose for opening the inner hips because you let gravity help pull your knees down, instead of forcing your knees out. Again, focus on just letting the opening happen. Starting on your back, arms by your sides, bring the soles of your feet together below you as you allow the outsides of your knees to fall toward the mat. Close your eyes and take in several deep breaths, even choosing to hold this pose for a minute or two. When you’re more open, you can practice a seated Bound Angle Pose, bringing your hands to your ankles and using your elbows to press the knees open more. Runners, please don’t neglect your hip flexors. They get tight as you run, too, which will only get worse if you sit all day. That’s why Low Lunge is absolutely on my list of the best hip openers for runners. Low Lunge is a great way to stretch the hip flexors, not only because of the positioning of the body, but also because you can shift your weight forward to intensify or back to make the pose feel a little less intense. Make sure you keep your front knee stacked over your front ankle. If you have bad knees try taking a blanket or a pillow under your back knee for support. Hold for a few breaths, even up to 30 seconds, then carefully release and switch sides. 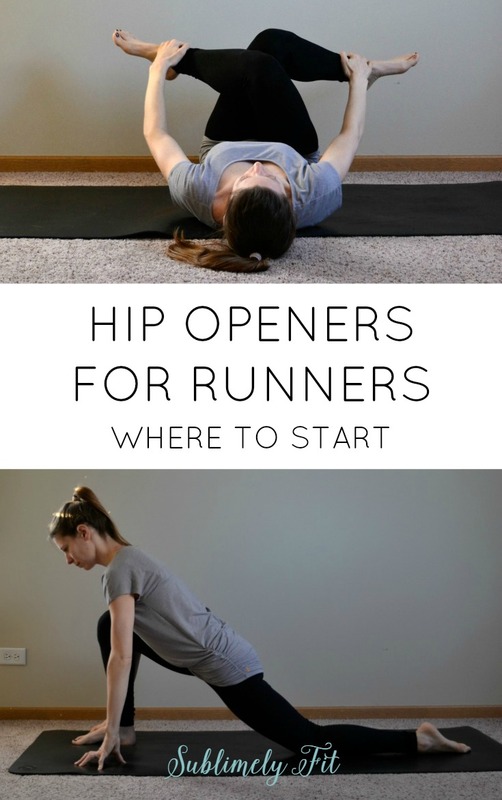 I hope you love these hip openers for runners as much as I do! Again, the key is to find the right pose for your body. Don’t force yourself into a deeper pose because that’s what your friends do—your muscles will stay much tighter if you do. When you find that sweet spot of a gentle stretch where you can relax and release, you’ll find that your hips will open much faster. Good luck! Namaste! Linking up with Jill for the Fitness, Health and Happiness linkup! I love, and practice, all of these awesome poses! My hips definitely need the love when I’m training hard. Love all of these. I also love garland pose. Feels soooooo good. Love my yoga sessions. Hip openers are definitely helpful! I do these regularly. I love a good hip opener, especially any variation of pigeon! These are great as I have super tight hips. I love pigeon. Thank you for the tips! I looooove pigeon and do it quite often, but these will be great when I’m feeling particularly tight! I think I’m going to add these to my usual rotation of poses! Love all of these! My hips are often tight and while I love pigeon and the runners lunge, it’s nice to have other options too! Pinning! I’ve started doing hip openers and I’m realizing wonders about how bad my hips are!! I’ve always done pigeon, but low lunge and reclined bound angle have been great new additions. Hi Beth. Ironically, in the past week my left hip is so so incredibly tight. I’m convinced it’s the amount of time I spend sitting at work. Ugh!